Posted on January 23, 2018 at 2:54 pm. Popular honeymoon destination, Santorini, could soon become home to one of three new casinos planned for three Greek Islands, but not if Santorini’s Mayor, Nikos Zorzos, has anything to do with it. Mayor Zorzos has penned a letter, stating his island doesn’t need the investment, and the construction of a casino would impact the island’s “economy, culture, and social structure”. The letter, prompted by a draft bill tabled by the Greek Government, would see three casinos built in Santorini, Crete, and the party island Mykonos. The bill will also see six land-based casinos in Greece relocated. 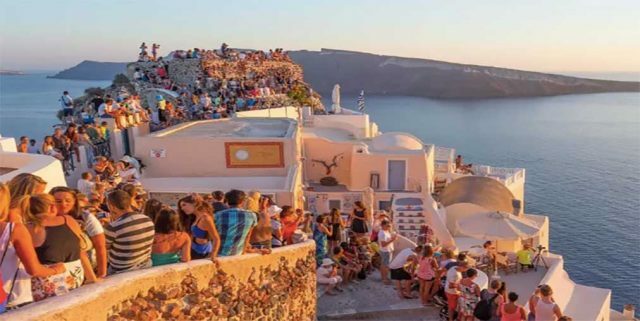 Santorini isn’t the only island to contest plans to pull people away from the overcrowded Sunset spots for slots and table games, as the Mayor of Mykonos, Konstantinos Koukas, has also penned a letter to the Greek Prime Minister, Alexis Tsipras. But Mykonos isn’t arguing that a casino will change the character of the island, or attract different tourists to the usual backpackers or those who just married. The Mayor instead said the island has more pressing issues to attend to, such as building more hospitals, schools and other infrastructure to attract workers to Mykonos. He said only then could the island look at adding a casino. The third island set to receive a gambling venue, Crete, has also opposed the draft bill and has been gearing up to campaign against any legislation changes. The opposition from the three islands has reportedly left the Greek Finance Ministry looking for a compromise. The Greek Reporter revealed that the government could propose an amendment, enabling future casinos to close during the off-season from October to March, rather than operating all year round. The bill, presented in December, aims to bring additional revenue to the country. If approved, the only gambling venue in Athens, the Regency Casino Mont Parnes, will be able to move from the mountain and into the capital city. The Hellenic Gaming Commission would also have more responsibility when it comes to licensing and regulating the three new casinos, as well as relocation requests. Another amendment to the country’s gambling laws includes the gaming tax, with a flat tax rate expected to be determined in the future. Casino operators currently share up to 35 percent of gross gaming revenue with the government. But the gambling bill may not make it past the draft stages, with Mykonos councillors approving its Mayor to fight the legislation via legal action. Meanwhile, another bill has been presented in parliament this week, allowing nine gambling venues in Greece to extend credit to their players. The bill aims to attract wealthy foreign players, similarly to what British casino operators are calling on their government to change. Since the chips are counted as casino revenue, the lines of credit are taxed which means more money for operators and the government. Casino games are a lot of fun, and the internet has created a new level of interactive gameplay for real money. Players from United States can see what we mean by checking out our favourite site Raging Bull Casino.